"Pink variety of dogwood at the college entrance, early 2000's" by L. Michael Hill Ph.D. The pink variety of dogwood, Cornus florida forma rubra (Cornaceae), is never seen in the “wild.” It is a genetic selection grafted onto the rootstock of a white dogwood. 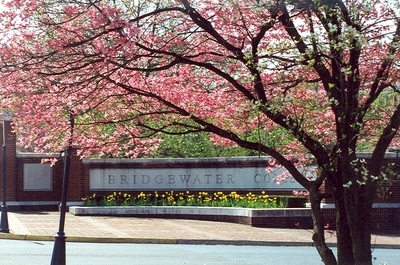 This view highlights the Bridgewater College “sign” visible if you are driving east on Dinkle Avenue, early 2000’s.